Good Saturday morning. I hope you all have had a great start to your weekend. Heather from Princess' Paper Projects here today. It is my turn as featured designer and I have a cute card using a new to me Cricut cartridge for the upcoming Easter weekend. I am in love with the Teddy Bear Parade cartridge and can see myself making lots of these little teddies to be paired with an Action Wobble spring. How cute is he??? 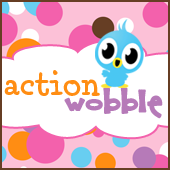 If you have not yet tried an Action Wobble, you can purchase them at The Royal Castle Shoppe. Enjoy your day. Until next time, keep crafting. Such a cute card, I like that bunny suit.